Charles IV was a King of Bohemia, a region consisted mostly of lands from the modern Czech Republic, during the 14th century. He was also Emperor of the Holy Roman Empire, and heavily influenced Central European affairs. 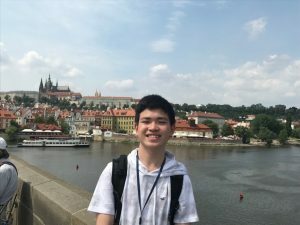 During his reign, Prague flourished to become one of the most important cultural cities in Europe, with numerous symbolic constructions built, such as the Charles Bridge, Cathedral of Saints Vitus and so on, some of which we were very fortunate to have visited during the duration of our 11 day tour. Being commonly referred to as the father of the nation, his reign was, to a large extent, significant to the present day development of Prague and its rich and noble history. Part of Prague Castle, an ancient castle complex consisting of various royal palaces and churches as well as the current office of the Czech president, St. Vitus Cathedral was arguably the most iconic building of the castle complex itself and one of the most important constructions of Charles IV’s reign. Charles IV largely contributed to its construction by inviting grand architects such as Matthias of Aras, who designed the overall layout of the building and Peter Parler, who completed Matthias’s unfinished work but also added some of his own innovative ideas to bring a new touch to the cathedral. Both of these architects featured a high Gothic style, a symbolic architectural style of medieval times, with prominent characteristics such as the use of flying buttresses, rib vaults, stained windows and so on. As we visited the cathedral on day 7 of our 11 day tour, the first thing we noticed was the large amount of tourists present at the entrance. 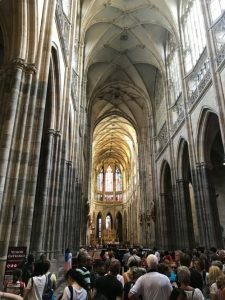 We usually never had to wait in line to visit any of the attractions of the tour, but not the St. Vitus Cathedral. It took us nearly 20 minutes to get inside, and even then it was fully packed, and we had to move really slowly with the crowd to advance further inwards. As the tour guide guided us through the cathedral, we learnt that the St. Vitus Cathedral was once a place for the coronation of Bohemian kings, and also served as a crypt for members of the royal family. It also housed the Bohemian crown jewels, which was securely stored in a room on the sides of the Cathedral. The vault itself consisted of seven locks, with each key held by a different religious and political leader of the Czech Republic, and must all be present in order to gain access to the crown jewels. 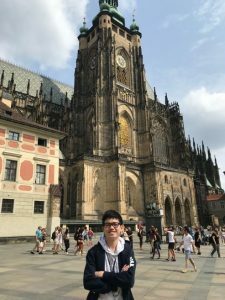 Visiting the St. Vitus Cathedral was a truly memorable experience, being able to witness the one of the most famous Gothic buildings in the world, and its iconic features like the net-vault with double ribs and its beautifully stained windows, was an experience of a lifetime. No wonder it remains one of the most symbolic architectures of Prague, and why Charles IV is still considered one of the most important leaders of Czech history today. He definitely made his mark in history with this one. Connecting Prague Castle to Prague’s old town is the Charles Bridge, another highly iconic symbol of the Czech Republic and of Charles’ reign itself. Also designed by Peter Parler, construction of the bridge started in 1357, with legends claiming Charles IV placed the first stone of the bridge himself, and finished by early 15th century, a few years after Charles IV’s death. For years it was the most important connection between Eastern and Western Europe, facilitating great amounts of trade between the two areas. 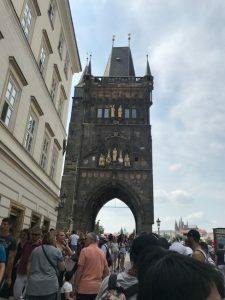 Today, the famous Charles Bridge is filled with thousands of tourists everyday, packed with souvenir and art booths all along the great bridge. The Bridge is decorated by numerous statues on both sides, with the most famous and popular one being that of Charles IV’s, with numerous tourists waiting in lines to touch its foot, hoping for good luck. Overlooking the river Vltava, the bridge also features quite a magnificent view, with other iconic buildings like Prague Castle not far away, it’s a great place for Czech sightseeing. 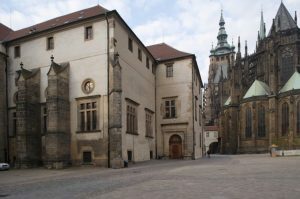 Last but not least, Charles IV was also largely credited for the reconstruction and expansion of the Old Royal Palace, which has been here since the 11th century. It consisted of mainly three floors, with the Gothic second floor being built during Charles IV’s reign. Yet, it is probably most famous for its third floor, or the Vladislav Hall, a place used to hold public events for the Bohemian monarchy in the past but also the modern Czech government today. 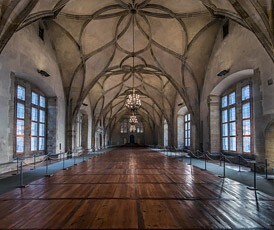 Its complex design of its ceiling, or vaults, was of a very unique and refined design the Middle Ages, and is most likely what contributed to its popularity today. With numerous symbolic buildings such as the St. Vitus Cathedral and Charles Bridge built during Charles IV’s reign, Charles IV was thus very historically significant to the Prague we know now, and being able to witness all of these buildings of historical importance, was definitely very memorable and enjoyable. So long, Prague!